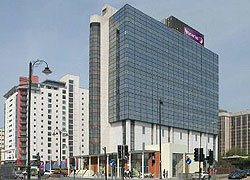 Premier Inn have recently opened a new 200 room hotel in Cardiff city centre. This brand new Premier Inn is located in the former British Gas headquarters at Helmont House on Churchill Way, which makes it one of the closest hotels to the Cardiff International Arena. The building has been completely refurbished and has been open for business since February 8th 2010. Brand new hotel following a complete refurbishment of the building. City centre location, close to shops and CIA. Great views across the city from the upper floors. Air conditioned guest rooms with en-suite bathrooms. Restaurant serves traditional and contemporary dishes. Costa coffee shop on premises.